Chefs from Sysco get help from audience volunteers to demonstrate making chicken crispers. The chicken strips were covered in a rice cereal coating and baked, giving kids a healthier alternative to breaded and fried chicken strips. The demonstration was part of the inaugural Kids LiveWell event at Edwards Air Force Base. A group of children at Edwards Air Force Base, Calif., were treated to food, activities, education and fun at Club Muroc Oct. 27 as part of an Air Force-wide healthy lifestyle initiative called Kids LiveWell. 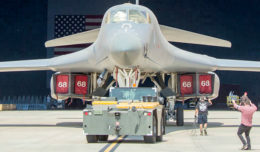 Forty-seven youngsters, their parents, and volunteers showed up to help Edwards become the second base in the Air Force to launch this initiative. 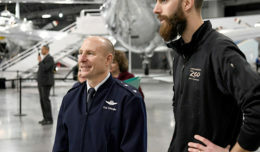 Wendy McCollum, Club Muroc’s general manager, got involved with Kids LiveWell during a food and beverage seminar at Joint Base San Antonio, Texas, where the Air Force launched the program. 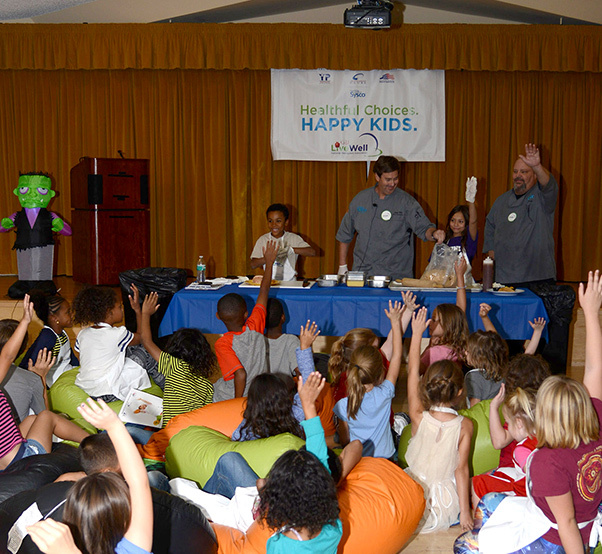 The initiative is designed to provide parents and children with a growing selection of healthful menu options when dining out, and to identify restaurants that offer healthier children’s meals based on nutrition criteria recommended by leading health organizations, according to program leads. It also aims to develop a program that appeals to all segments of the restaurant industry from independents to chains, and to quantify annually the number of healthy options for children in participating restaurants and aggregate the impact of those options. Finally, Kids LiveWell will help recognize and grow the industry’s efforts and commitment to the reduction of childhood obesity. At Edwards, the cooperation of local volunteers and chefs and representatives from Sysco food services made the inaugural event a success. The evening’s highlights included a story, a couple of cooking demonstrations by Sysco chefs, and some physical activities. After the introductions, the children were treated to story time. ”Tyler Makes Spaghetti,” read by Star Cochran, was a story about chefs and preparing food. “This transitioned flawlessly into the chicken crispers demonstration by Chef Jaime West,” McCollum said. West used volunteers help make baked chicken tenders with rice cereal coating, a healthier alternative to breaded and fried. The demonstration and tasting was followed by some physical challenges. Amy Tromba led some of the children in jumping rope and hula hoop contests, while Shannon Simmons took another group on a “hike through the desert,” imitating local wildlife such as coyotes and scorpions using yoga positions. Once the hike ended, the groups switched and the adventure continued.